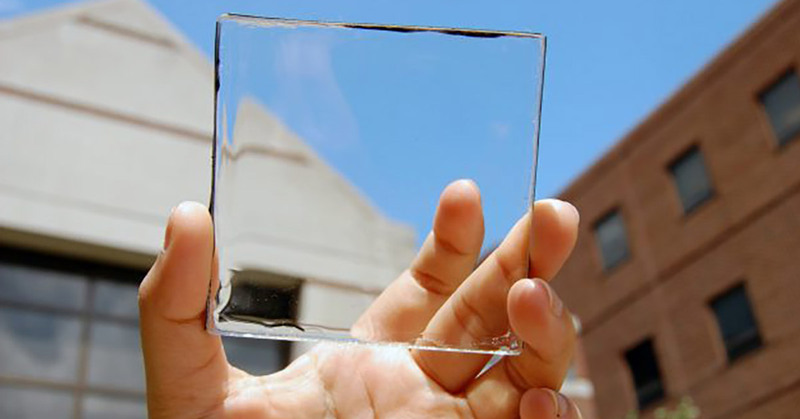 The researchers from Michigan State University made new transparent solar panels that can have many applications in architecture and other different fields such as the automotive industry and mobile electronics. Researchers have tried to make such a device before. However, they couldn’t do it. The team of researchers concentrated on the see-through factor that is why they made TLSC, i.e., transparent luminescent solar concentrator. It may be placed over a window. Also, it may harvest solar energy without impacting the transmittance of light. This specific technology uses organic molecules that absorb light wavelengths non-visible to the human eye like ultraviolet and infrared light. The assistant professor of chemical engineering and material science at Michigan State University’s College of Engineering by the name Richard Lunt talks on this topic. He says that they can tune these materials in order to pick up only the ultraviolet and the infrared wavelengths which “glow” at another different wavelength in the infrared. The vertical footprint is bigger in comparison to the rooftop one, particularly in glass towers. And so these devices might make the most out of the facades of the buildings. These devices wouldn’t impact the architectural design but will show a far more efficient technology. Also, they may be integrated into old buildings as well. The New York Times says that if the cells may be made to last long, they might be included into windows cheaply. The cost of conventional photovoltaics isn’t from the solar cell but all the materials it’s mounted on such as glass and aluminum. Coating the structures with solar cells might help get rid of some of the material cost. In case the transparent cells prove commercially viable, the power they produce might notably offset the energy use of big buildings said Dr. Lunt, the person who started teaching at Michigan State University. He said that they aren’t saying that they may power the entire building but that they are talking about a notable amount of energy enough for things such as powering everyday electronics and lighting. At the moment the team is working on improving the energy-producing efficiency which is around 1 percent right now. The goal is to get to an efficiency which will be beyond 5 percent. If developments work then the applications would be countless. The members of the research team of MSU are Garrett Meek, Yimu Zhao, and Benjamin Levine.